Chief Minister Pema Khandu today requested Rambhau Mhalgi Prabodhini (RMP) and similar organisations working to promote the culture of entrepreneurship and self-employment amongst marginalized sections besides providing essential ecosystem for Start-Ups for skill development to turn their focus on the Northeastern States and work to motivate, facilitate, mediate and mentor local youths, who, he pointed, possess in-born talents but lack proper guidance and the right kind of motivation. He was addressing as the Chief Guest in the valedictory function of the Economic Democracy Conclave organized by RMP at Thane, near Mumbai, here this evening. He assured his all-out support and cooperation in any such endeavour of the RMP in the region. Appreciating RMP for organizing the Conclave involving entrepreneurs as well as self-employed individuals and create a platform for them to share their agonies and aspirations, Khandu hailed the organization for also providing them motivation, networking and mentoring opportunities so that they can independently become not only self-employed but turn employers too. He said economic democracy, in its truest sense, is still a far cry in the North East despite having huge potentials. Khandu spoke about the ambitious and people-friendly Deen Dayal Upadhyay Swawlamban Yojna (DDUSY) implemented by the Arunachal Pradesh government to offer start-ups for enthusiastic local youths and become successful entrepreneurs. He informed that Hundreds of unemployed youths have benefited so far from the DDUSY that facilitates bank loans from Rs 10 lakhs to Rs 1 Cr for setting up greenfield enterprises with 30% subsidy. Implemented district-wise top priority is being accorded to projects related to agriculture and allied sectors including tourism and textile and handicraft production, he said. The Chief Minister also urged the young entrepreneurs present in the conclave to explore potentials in the North East. “North East, especially Arunachal Pradesh, as I always say, still remains to be explored and exploited by entrepreneurs. You and your bright ideas if partner with the huge potentials and energetic local youths would play wonders I am sure. And rest assured, our state government will offer all possible support in your endeavours once you decide to come in,” he offered. Khandu said people must be thankful to Prime Minister Narendra Modi for seriously attempting to bring in economic democracy along with political democracy with schemes like Start Up India, Stand Up India, SC-ST Venture Capital Fund, Mudra, Make in India and others. “Beneath all the outrage about crony capitalism, inept governance and absent jobs is an unrest that arises from a fundamental mismatch between the economic and political sphere. We are lucky to have a Prime Minister who is serious in bringing economic democracy along with political democracy,” he said. 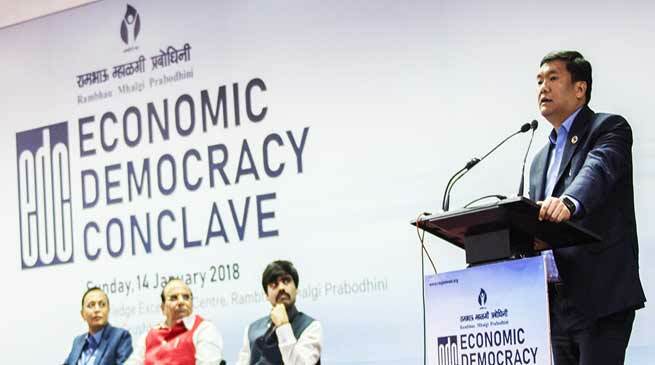 Khandu said the main goal of economic democracy should be to align market forces with the core aspiration of democracy — which Mahatma Gandhi aptly expressed through the term Sarvodaya — literally, the well-being of all. He also reminded all that Gandhiji always said India resides in its villages therefore economic growth of villages would only ensure economic democracy in the country. The one-day Conclave for entrepreneurs majorly from the marginalised sections of the society was attended by around 300 youngsters from the districts of Thane, Palghar, Mumbai and Mumbai Suburban. MoS Finance Shiv Pratap Shukla, RMP President Prof Aniruddha and RMP Vice President Dr Vinay Sahasrabuddhe, who is also a Rajya Sabha MP, also spoke on the occasion. Earlier in the day, the Conclave was inaugurated by President Ram Nath Kovind in presence of Governor of Maharashtra C. Vidyasagar Rao and Chief Minister of Maharashtra Devendra Fadnavis.